For a few days, the TTC’s 2017 fare increase was the big topic of discussion. Could it be justified? Will the TTC be able to operate its service without major cutbacks or a fare increase beyond a dime on the cost of a token? With the announcement that Mayor Tory supports the implementation of a $2 toll on the Gardiner Expressway and Don Valley Parkway (the two highways under the City of Toronto’s control), all focus has shifted to those tolls and other proposed taxes. The potential new income is substantial (over $200 million yearly from tolls), but this money would be dedicated only to financing the huge deficit in the city’s transportation and transit capital needs. Got a new subway you want to build? Got an expressway to patch up? The capital budget is where to look for cash. Missing in the excitement, the wonder that our mayor would actually support a new tax, is much thought for the city’s operating budget, the one that keeps the lights on, that subsidizes transit service, and fills the potholes. The TTC Board passed a budget on November 21 that was deliberately not balanced, but left a $61-million hole for Council to fill. Members of that Board could not bring themselves to approve the changes that would be needed to square their budget including a further fare increase, cuts to or eliminations of discounts, and increased crowding on transit service. The hole is actually bigger, about $100 million, because the budget assumes that the City will pick up certain costs as a new subsidy, even though the city manager has already rejected this scheme. Regardless of who pays the bills, that is the gap in transit’s operating budget facing councillors. We could even see the budget hawks lecturing the TTC for its failure to meet the mayor’s demand for a 2.6 per cent budget cut, although the TTC went through the charade of finding $15.6 million as part of a much larger trimming exercise. Mayor Tory announced that he supports two new revenue sources—a hotel tax and the elimination of a tax holiday for vacant commercial property—that together could bring in $42 million. That is less than half of the TTC’s shortfall, never mind the many other parts of Toronto’s budget where more operating dollars are needed. The mayor is proud of reversing the transit cuts made by Rob Ford, and the TTC continues in this vein touting how a proposed large bus order will add to service. Sounds great, a nice soundbite, but there is no new service without the money to pay drivers and maintenance technicians so that the new buses can roll out of the garage. 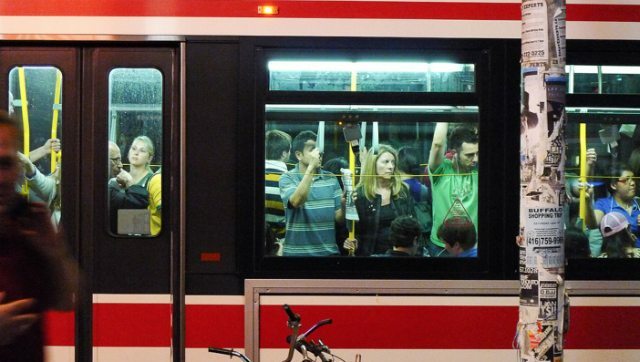 Every percentage point of inflation will add $17.7 million to the TTC’s costs. The full year operation of the Spadina Subway Extension will come onto the TTC’s books at a net cost of $23 million ($7 million is already part of the 2017 budget). The cost of fare collection will continue to rise with the PRESTO fare card roll out. Fees and other costs for the new system are not fully offset by reductions in “legacy” fare collection expenses. The TTC Board has voted to have a fare freeze in 2018 which, based on the 2017 budget, will cost close to $30 million in foregone revenue. It is quite likely that the TTC will face another $100-million gap in 2018 just for these items. This is a problem that will not go away. On the City’s capital side, projected costs for major projects spiral upward, and new schemes like Rail Deck Park are announced almost weekly. The cost to renovate the Gardiner Expressway including the revised connection to the Don Valley Parkway went up $1 billion in a just-released updated estimate. The Scarborough Subway Extension, originally packaged with the Eglinton East LRT extension to University of Toronto’s Scarborough Campus, is now sitting at $3.6 billion. This is expected to crest $4 billion by the time a more thorough estimate lands before council. For the LRT line, the sweetener for the subway deal, no money is available. The list goes on and on with price tags that dwarf the needs of even a modest improvement in day-to-day transit service. Mayor Tory loves to stand behind a podium crowing about his investments in Toronto’s transportation system, but the slogan “Saving You Money” adorning that podium says everything we need to know about his real priorities. When Tory says, “We cannot cut vital services that mean so much to people,” he is silent on just which services he considers vital and on how he will pay for them. While motorists fret that the cost of their commute is about to go up with road tolls, remember the poor transit riders who just make do when their bus shows up packed to the roof, if it shows up at all.